The biggest night of the year for the music industry took place last night – The 61st Annual Grammy Awards! Taking place at the Staples Centre in Los Angeles, it was hosted by the queen herself Alicia Keys. The ceremony itself featured performances from Cardi B, Dua Lipa Travis Scott and more. As the celebrities started rolling in the more heads started to turn, with the different shapes and colours of the outfits to elegant and sleek fitted suits and dresses. I think one of the most unique and stand out pieces of the evening (the year) was Cardi B’s 1995 Mulger Couture dress which made her look like something out of a Disney film. The breath-taking Janelle Monáe then arrived in her incredible Jean Paul Gaultier couture dress with pointed shoulders. What finished her outfit exquisitely was the Wide and oversized gold and white hat. Effortless yet standout! One popular and memorable speech came from Drake, while dressed head to toe in Tom Ford . 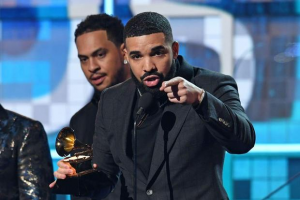 Aubrey took a sly dig at the awards ceremony stating that Artists should not be measured on success by the awards that they win. He went on further to say “This is a business where sometimes it’s up to a bunch of people that might not understand what a mixed-race kid from Canada has to say or a fly Spanish girl from New York, or a brother from Houston,” he continued. “The point is, you’ve already won if you have people who are singing your songs word for word. If you are a hero in your hometown, if there’s people who have regular jobs who are coming out in the rain, in the snow, spending their hard-earned money to buy tickets to come to your shows, you don’t need this right here,” Ending on the highest note which had the crowd cheering “I promise you, you already won”. Drakes speech was agreeable by most if not all in attendance and also everyone watching live. Trending on twitter, Instagram and Facebook his speech hit home, and summing up artists perfectly and making sure everyone feels valued. Childish Gambino (who wasn’t in attendance) won his third award for the famous “This is America”. The song was quite a point of controversy last year after some people accused him of copyrighting a song from New York rapper Jase Harley. “This is America” and Harley’s “American Pharaoh” have a similar sound and share similar themes in the lyrics. Donald Glovers team denied the accusations. Gambino was nominated for five total awards last night; in addition to record of the year, the rapper & singer song writer earned approval in the categories of song of the year, best R&B song, best rap/sung performance, and best music video. Gambino’s This Is America video — which contained violent imagery — was also filled with commentary on gun violence, CNN noted. In the beginning, Glover shoots a tied-up man in the back of the head; the gun is then handled with care as the body is dragged away. He later unloads bullets on a gospel church choir, a possible reference to the nine people killed in the 2015 Charleston church shooting. Again, the firearm is taken away on a red cloth. Despite having some backlash for simply making a violent video for controversy’s sake, many celebrity’s praised Gambino for putting a spotlight on some major issues that have been occurring recently in America, including Jaden Smith, Adele, and Terry Crews. Another famous face who didn’t grace the Grammys but also won an award was Ariana Grande. This was her first Grammy Award in her career. She tweeted the same evening thanking people and how she felt. Kendrick Lamar had the most nominations of the night with eight. He’s being widely recognised for his work of Marvel’s “Black Panther,” including his single “All the Stars” with SZA which has been one of his most popular hits to date. All in all the Grammys this year were definitely something to not have been missed, with luxurious outfits, incredible performances and motivational speeches. Lets see what 2020’s brings us!